The company behind a $650 million solar thermal power plant planned for Port Augusta has failed to secure finance. SolarReserve's Aurora Solar Energy Project was to be the saviour of the town after the closure of its coal power station in 2016. Solar thermal systems use mirrors to concentrate sunlight onto a central tower with a giant chunk of salt at the top. Sunlight heats the salt until it is molten, and that heat is used to generate steam that spins a turbine to generate electricity. 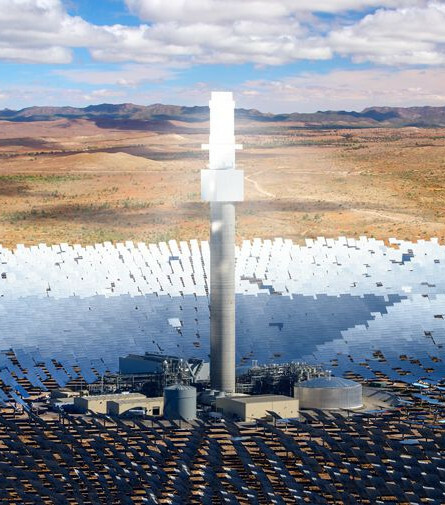 The SA Government gave the project a deadline of March 31 to secure finance, but Energy Minister Dan van Holst Pellekaan says SolarReserve has officially told him it will not reach financial closure. Mr van Holst Pellekaan said the Government is still looking to fill a long-term electricity contract. “Very importantly, if SolarReserve is able to sell some of its IP, their land access there, their other permissions … to a third party, that third party will be very welcome to bid into the new market procurement process which we're about to undertake,” he said. Opposition Leader Peter Malinauskas says the solar thermal project failed because of the State Government's plan for an interconnector to New South Wales. He said the interconnector project prioritised “dirty coal power over South Australian renewable power”.